Everyone knows that TeamViewer is one of the best, if not the best remote desktop and remote access software out there. This cross-platform is truly cross-platform as it supports Windows, Mac, Linux, ChromeOS, Android, and iOS. TeamViewer 13 has just been released. The TeamViewer 13 brings in plenty of improvements and a couple of new features to this free for personal use software. To start with, the TeamViewer 13 sports a more intuitive interface. Accessing all the features and options are easier than before. iOS screen sharing is probably the highlight of this version of TeamViewer as it now allows you share your iOS screen with devices running not just Windows and Mac operating systems but also Chrome OS, BlackBerry, and Android. There is a brand-new job queue in the file transfer feature. It now lets you add multiple files for transfer and TeamViewer will transfer all files one after the other. You can also change the position of files in the queue via drag and drop, even when the transfers are running. If you own iPhone or iPad, you can now mirror iPhone/iPad screen on your Windows 10 PC using TeamViewer. 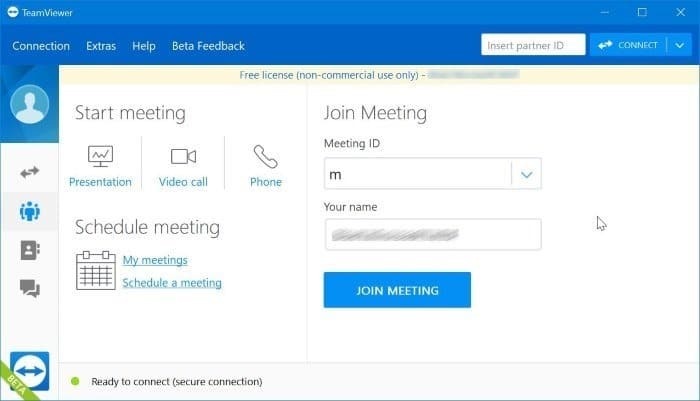 The log-in time has been significantly improved in TeamViewer 13, allowing you to start your work without having to wait. You know that TeamViewer supports remote printing for a long time. In TeamViewer 13, remoting printing has seen some great improvements. According to the official blog, TeamViewer 13 supports remote printing in all colors you print supports. TeamViewer 13 makes use of hardware acceleration to be more responsive and smoother than ever. Automated service case assignment is another new feature available in this new version of TeamViewer. All-in-all, a good update for a great software. 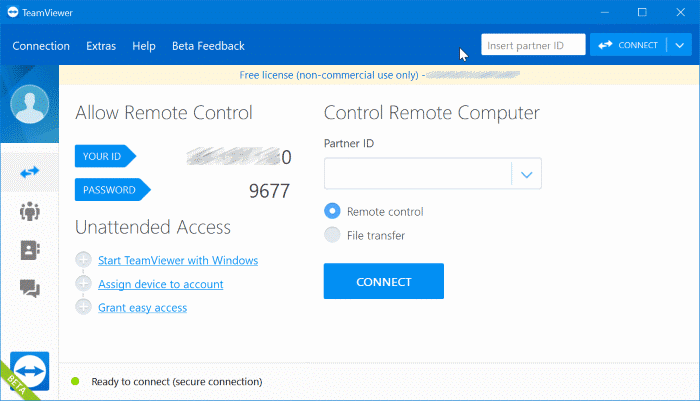 If you don’t want to install but cannot resist from trying out the newest version of TeamViewer, you can download the portable version of TeamViewer 13 program from the link provided at the end of this article. Visit the following link to download TeamViewer 13 installer. In addition to the standard executable, MSI installation package is also available. You can easily upgrade the current TeamViewer installation to the latest version without uninstalling the current version. To do so, open TeamViewer, click the Help menu and then click Check for new version option to automatically download and install the latest version. As said earlier, TeamViewer is free only for personal use. Other alternatives to teamviewer which you can use are logmein., R-HUB remote support servers, Bomgar gotomypc etc. They work well.